Well here we are then, the final part in the series (follow the links for Part 1, Part 2 and Part 3). The suit is made and I couldn’t be more pleased with the result, particularly with regard to the trousers. Indeed, the suit must have something about it as I wore it to a second round interview and got the job. That’s one special suit alright. 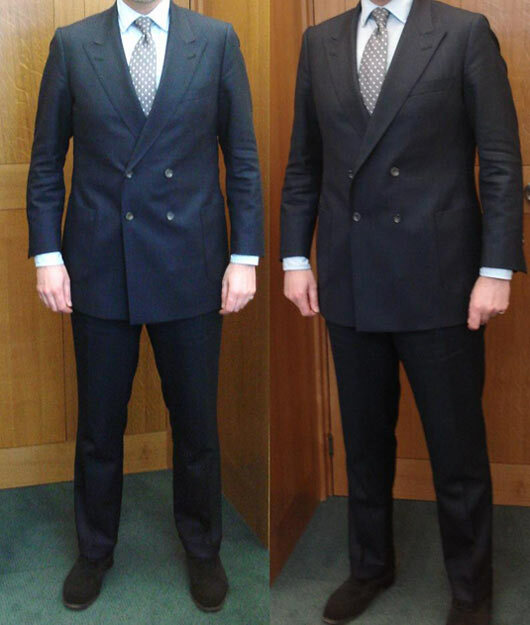 Recapping, I set Erlend at Stephan Shirts a number of difficult tasks to test his made-to-measure suit service. 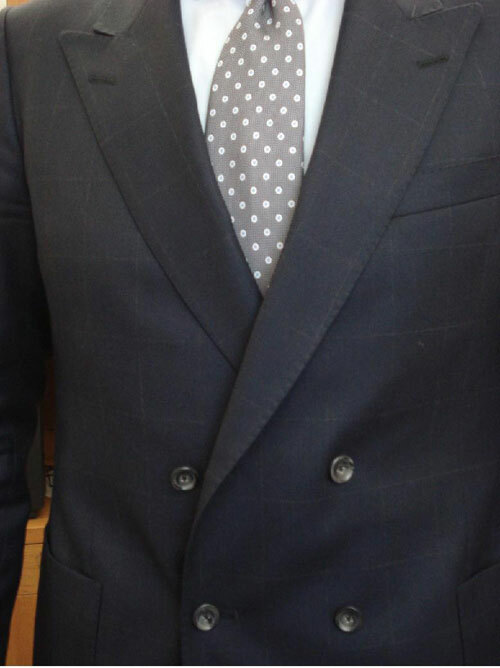 First there was the suit jacket, a 4×2 double breasted in the Kent style. Because of the need for perfect button placement and a soft roll lapel it’s a tricky jacket to get right. Other details include five button working cuffs, a loop behind the lapel buttonhole and the jacket’s distinctive British Racing Green lining –which I chose- is even carried over into the top pocket. While the suit is still a little stiff and needs a little more wear to soften it, you can see the jacket is pretty much as requested and desired. The next most difficult task was getting the trousers right. Trousers don’t sound a tricky matter but then I’m well over my fighting weight. I asked for two pairs to be made, the first pair having classic English pleats, also referred to as ‘inward’ or ‘forward’ pleats, because the pleat goes in the direction of the fly (‘outward’ or ‘reverse pleats’ open in the direction of the pockets). This style of trouser only really works when the trousers sit on the natural waist and are held up by braces, for which I wanted a fishmouth waistband. Erlend has cut the trousers just right in my view. The danger with pleats –even inward facing pleats- is that they can make you look big, particularly if you actually are a bigger build. 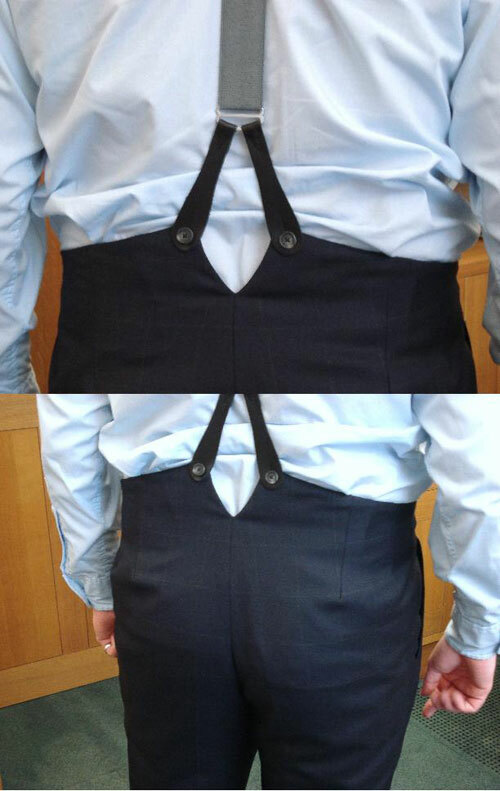 The high waist helps to counter this, but only a skilled cutter could make a trouser that fitted my large waist and seat whilst managing to emphasise what are nicely slim legs. Nice little details include the half waistband and one piece back leading up to the fishmouth. Normally there would be a full waistband and then a second piece of cloth would be attached to that. It was my choice to have no back pockets on the trousers. I really don’t see the point of them. The second pair of trousers I term Italian styled. These are flat front with much thinner legs leading to a narrower opening and a full two inch turn-up. Sitting just above the hips but below the waist they’re slightly shorter in length than the first pair and work perfectly with loafers. Again, flat front trouser are a tricky proposition for the bigger man, but these look natural and sit perfectly. Indeed, I’m so pleased I’ve considered asking Erlend if in future he’ll make all my trousers. Now, at the risk of stating the obvious, the purpose of investing in bespoke is to get something which perfectly fits your body shape and masks, or at least de-emphasises, any physical quirks. However, all that comes at a hefty price, usually £1000 plus. Made to measure gives you some of those attributes and comes in at a much lower cost. Ultimately it’s a trade-off. But I can honestly say with Erlend’s suits those trade-offs are virtually nonexistent. The man himself is perfectly honest about what he provides. He calls it made-to-measure and doesn’t pretend otherwise, as you might expect from a former Savile Row cutter. Prices start at £495 and when you consider just what he is able to provide, the degree to which he is able to cut a pattern to suit your frame, and the level of understanding he has for the business of making a suit, I can’t help feeling that calling it made-to-measure is selling it short.